I am brand new to bonsai. 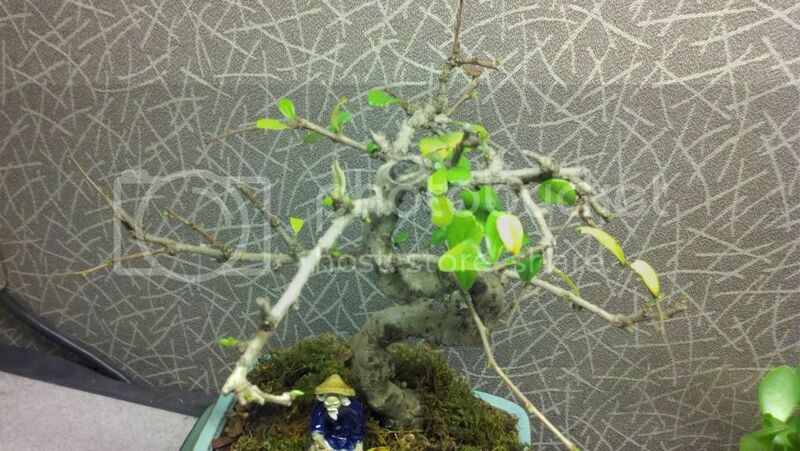 I received this Fukien Tea bonsai as a Christmas present. 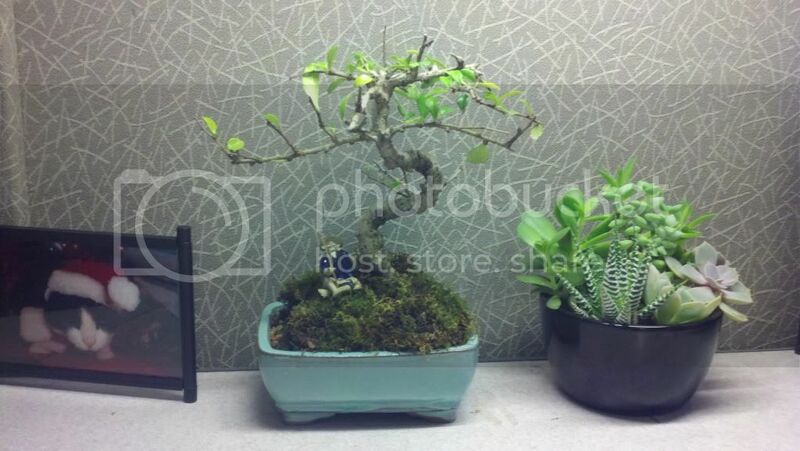 I am hoping to grow my bonsai at my desk at work. 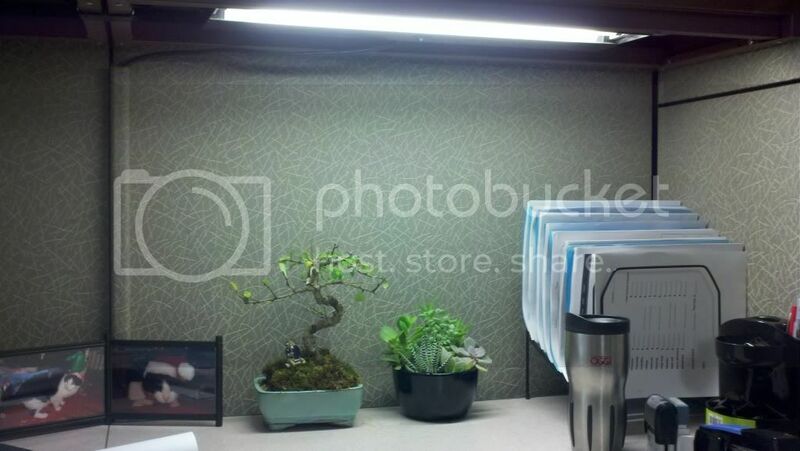 There are no windows in my cubicle, but I do have a fluorescent lamp attached to my desk. I work 8-4 monday to friday, and these are the hours where this light would be on. See pictures. As a beginner, I am just looking for some general tips for caring for my new bonsai. 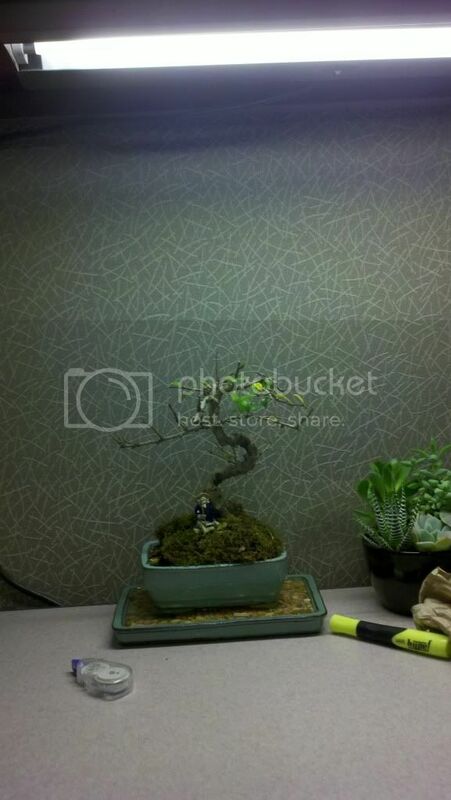 The salesman who sold my girlfriend the bonsai said it would do well indoors, and my initial research online confirms that it should. Based on what I've read, I think I will purchase a humidity tray and fertilizer. Any other advice would be greatly appreciated. Thanks in advance, fellow Bonsai-ers! My main concern is how your tree will cope over the two day weekend. Will it be in total darkness, or does your office have some kind of lighting other than that fluorescent lamp? Does that lamp stay on during the weekend or is it shut off? Due to the minimal lighting conditions I doubt your tree would thrive, but it would probably be just surviving. Just my two cents, but I would just take it home, and enjoy it there where light is more present. when i leave for the day i put the pot on top of the upper cabinets of my cubicle, so that when i turn off the desk light when i leave, they are still getting light from the ceiling fluorescent. the office is sometimes open on weekends, but not always. and my desk is in a center office with no access to natural daylight. i will consider taking it home but i would like to grow it in the office if possible. my girlfriend got it for me with the intention of sprucing up a bland cubicle and i'd hate to disappoint her if i don't have to. Well in that case, try it out for a few weeks to see how your tree does healthwise. If it's health starts dwindling then you know what you need to do. Tell your girlfriend it's for the sake of the tree's health. Much luck to you, and your bonsai! please let your gf know that FT is among the hardest to grow out of their natural environment and not to worry if it dies. Btw it doesn't look happy already. I'd recommend some kind of indoor ficus for growing indoors all year long but even ficuses benefit from spending their time outdoors during growing seasons. 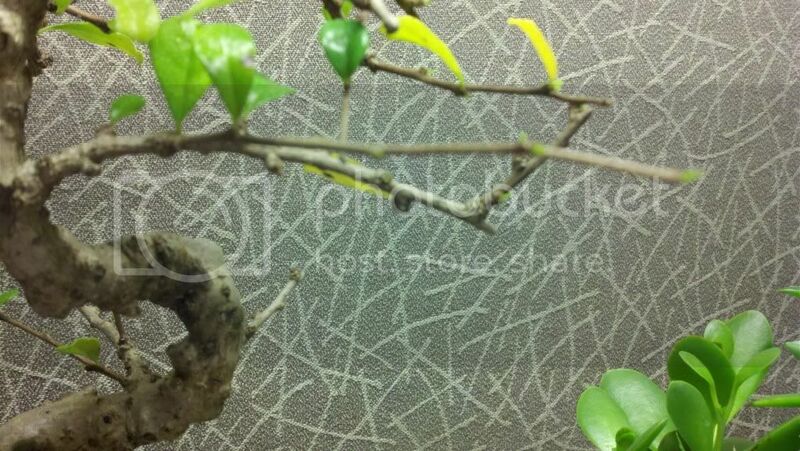 An office setting is rarely a good place for bonsai for all the reasons listed above - and this fukien tea does not appear to be a healthy specimen to start with. During warm weather I often bring a tree into my work space (from home) but only for 1 or 2 days at a time. Longer than than would be too risky. 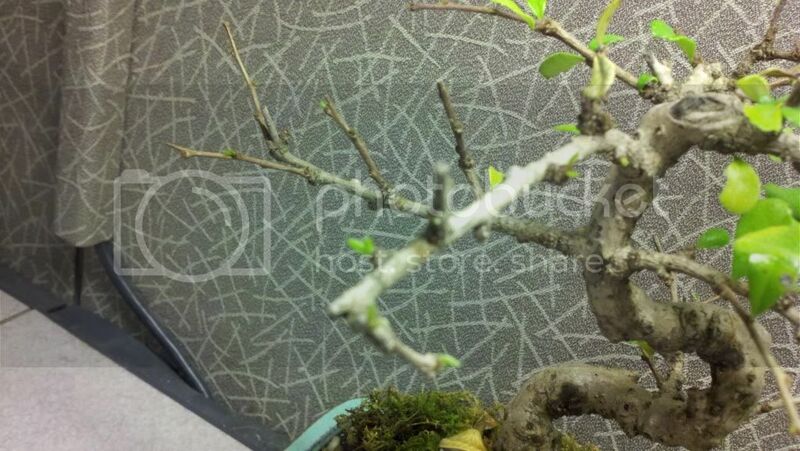 Please don't give up on bonsai if this doesn't work out. Try something at home where you AND your lady can share and learn from together. ok so I got back to work this morning after the long weekend and felt the need to post an update. I had left my desk light on over the 3 day weekend to avoid too much darkness. this morning some leaves had turned brown and had fallen off, and there are some yellow leaves also. 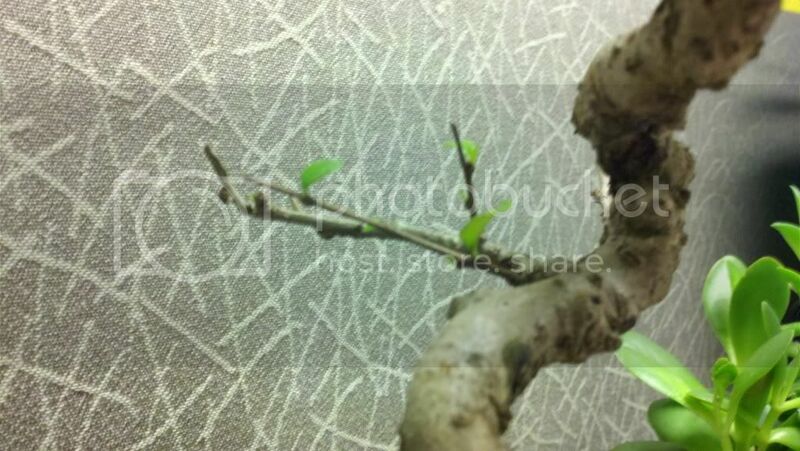 obviously these are not good signs, but i also can see some new leaves beginning to sprout throughout the tree...is this a sign that my tree may adapt to life in an office? or is it too early to tell? you can see i added the humidity tray. 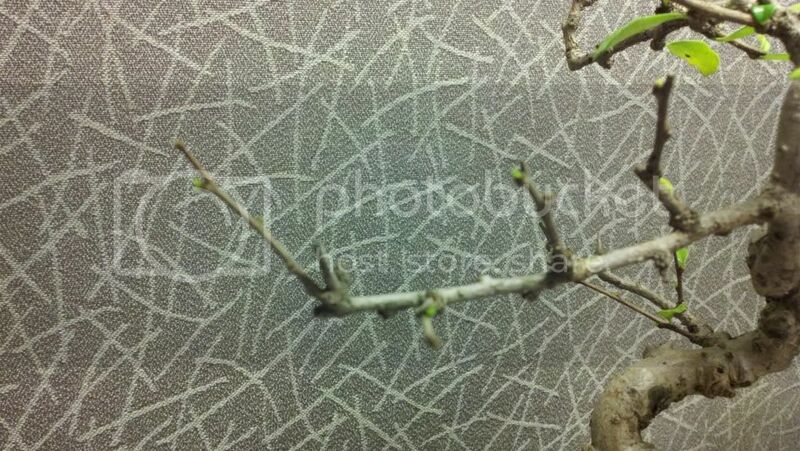 i also posted some pics of the new growth i mentioned above. might be hard to see but they're the best pics i can get. i would really like to try to grow this tree at my desk, but i would also opt to take home and try to save it rather than have it die at my desk. at what point should i abandon the office and bring it home? If there is a way you can set your tree on top of a box or stack of books or something so it is closer to the light, I think it will be happier. Curious how the little guy is doing after a few weeks.